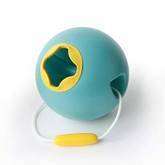 Ringo is the most versatile and compact pétanque game ever!Aerodynamic design and bold colors make Ringo the ideal travel game for any environment – it even floats on water! Includes 3 light-weight rings and a contrasting ball. The three differently colored rings ensure maximum visibility on any surface, while the soft edges ensure safety for younger players. 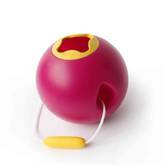 Ringo combines perfectly with other Quut toys like Triplet and Cuppi. You can even invent your own games! 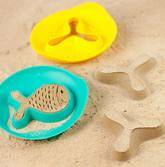 to scoop out sand castles and make tracks for the rolling ball. Or fill the specially engineered hole in the handle to write with sand or water. When playtime is over, snap the two cups together for easy transport. When at home, bring the Cuppi into the tub for bath time fun! 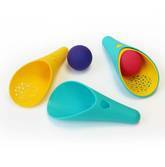 The Alto is a three-part toy inspired by professional sand-builders. It’s stackable, small-medium-large components allow kids to become an expert, creating firm structures that won’t crumble away in minutes. No need for multiple buckets...simply fill, press and form, now your multi-layered tower is done! The Triplet is a unique, multifunctional toy that is easy and fun to use. It’s part shovel, to help kids dig holes, build foundations and carve out moats. 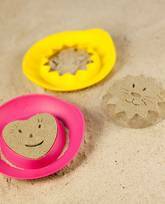 It’s part sand sifter, to help remove shells and other sediment, for smooth, shapeable sand. And it’s part rake, to let kids create extra designs. 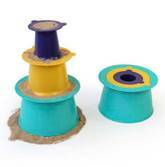 The hollow handle can even be used as water funnel to finish off the coolest sandcastles ever with sand art! Your child will love the Triplet – we wish we’d had one when we were kids! The Magic Shapers are a revolutionary improvement to a classic toy. No more filling and flipping sand. To fill, move the shaper around as it fills itself! Then just give it a little tap, lift and magic…the shape is done. And your shapers will work their magic with snow or bath bubbles too!! The shapes can be decorated and finished to your own imagination. Add eyes and adornments to make the shapes come alive. What will they be? A jellyfish, a cow or even a rocket? Both pieces click together for easy storage and are super easy to clean. The Magic Shapers are a revolutionary improvement to a classic toy. No more filling and flipping sand. To fill, move the shaper around as it fills itself! Then just give it a little tap, lift and magic…the shape is done. And your shapers will work their magic with snow or bath bubbles too! The shapes can be decorated and finished to your own imagination. Add eyes and adornments to make the shapes come alive. What will they be? A sun? A cupcake? A star? We know – it doesn’t even look like a bucket. But your kids will use it like one, and that’s what makes the Ballo so unique. Its smart design and soft-touch finishing makes it easy to grab water, run up the beach and pour with ease.